World Cup to kick up prices :Brazilian policymakers another headache: an inflation spike. BRASILIA (Reuters) - As if worrying about unfinished stadiums and overcrowded airports wasn't enough, the upcoming soccer World Cup will give Brazilian policymakers another headache: an inflation spike. The arrival of roughly 600,000 foreign tourists for the month-long tournament that starts in mid-June will likely cause substantial increases in the prices of airline tickets, restaurant meals and hotel rooms. Those three areas account for about a tenth of the weighting of Brazil's benchmark IPCA consumer price gauge. That could spell trouble for President Dilma Rousseff as the inflation rate is already at 6.19 percent. "The World Cup will make things more difficult for the government," said Reginaldo Nogueira, economics professor at Ibmec business school in Belo Horizonte. The World Cup has already been bogged down by cost overruns, delays in infrastructure projects and deadly accidents. Although the government expects the tournament to add half a percentage point to economic growth and thousands of jobs, rising inflation and persistently weak growth has eroded Rousseff's popularity as she seeks re-election in October. Nogueira said that price shocks from the Cup could be the last straw that puts Brazil's 2014 inflation target - between 2.5 and 6.0 percent - out of reach. Estimates as to the exact impact of the World Cup on consumer prices vary. Juan Jensen, chief economist with Sao Paulo-based consultancy Tendencias, said it may add 0.35 percentage points to inflation in June alone. Most economists agree that any spike will ease after the World Cup ends in July but some officials still worry it could scare consumers and contaminate expectations going forward, giving new impetus to price increases. The government has tried to cap hikes in electricity and gasoline prices but not much more can be done to tame prices during the tournament, two senior officials told Reuters. 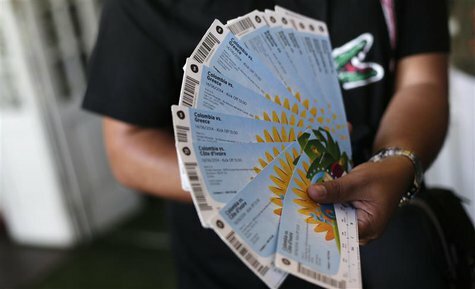 Luiz Roberto Cunha, an economics professor who advises the government on inflation data, said that all host countries tend to see rising prices when they host the World Cup. But he said the effects could feel greater because of already high inflation in Brazil, fueled by homegrown factors such as contracts that force annual increases in rents and other prices, as well as high government spending and even a recent drought that has caused a jump in food costs. Since the World Cup is being held in 12 host cities across Brazil, an unusually high number, any run-up in prices will be particularly widespread. Brazilians have already started to complain. A Facebook page called "Rio $urreal" was created to denounce high prices in Rio de Janeiro, which will hold the Cup's final in July. "It seems like drinking beer on a Friday is only for the rich now," wrote Luiz Felipe Oliveira in a recent post that complained of a local bar charging nearly $4 for a beer. In the capital Brasilia, already one of Brazil's priciest cities, tourists can pay more than $600 a day for a room at a four-star hotel near the stadium. A night at a fancier hotel can go for $1,000 during the tournament. Threats of strikes by metro, airport and hotel workers during the World Cup could also push wages higher and stoke prices even more. Not even one of the world's most aggressive monetary tightening cycles has been able to significantly ease the pressure. The central bank has raised its benchmark Selic rate by 375 basis points to 11 percent since April 2013.